1: First, you’ll need to draw out your full sized pattern. I like to use multiple references when making patterns. I used a shield that we bought for a Dark Link cosplay and the concept art for the shield in Twilight Princess from the Hyrule Historia. 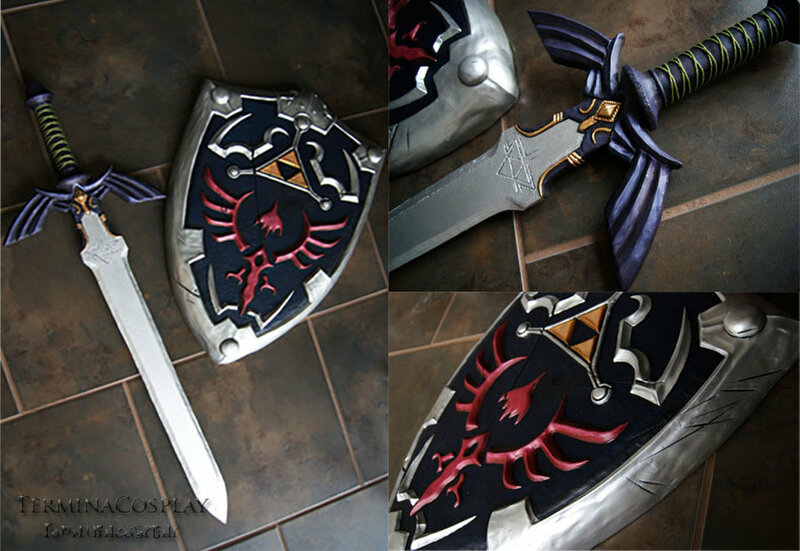 The Dark Link shield was used for size and the concept art was used for the details. To make your pattern perfectly symmetrical, draw only one side by hand, and then fold over down the middle and transfer what you drew over to the other side. 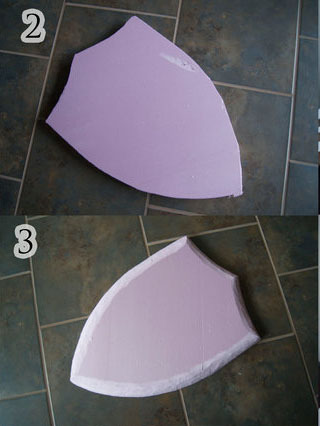 2: Next, take your insulation foam and use your pattern to draw the shape of the shield onto it. Then, take your carving knife (I use an adjustable exacto craft knife) and cut the shape out. 3: At this point, you will need to carve the round edges onto your shield. You can draw guidelines on your foam if you would like to, but I just kind of eyeballed mine. Just take your knife and cut off small amounts of the edges until you have your curve the way you like it. As you can see, my shield has curved edges but the center is still mostly flat. Thats how I wanted my shield to be, but if you want your entire shield to be curved, you will either need thicker foam, or you’ll need to double up another layer of foam on top of your first. One layer of 2 inch foam just isn’t enough to cut a curve through the whole thing and still look nice. Once you have your curve cut, you can sand it down smooth, though this isn’t necessary because your curve will likely be covered up later anyway. 4: The next step is to cover your foam in worbla. This will add durability and give it a nice surface. Cut out enough to cover the back of your shield and another piece to cover the front. Cut a little more than you think you’ll need to avoid any mistakes and make sure you have enough on the top layer to account for the curves. 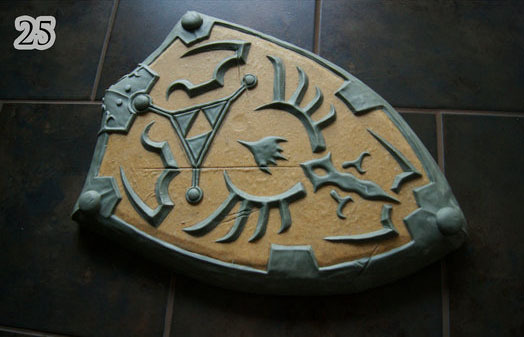 Now set your shield face up on the bottom layer of worbla and heat the top layer of worbla over the foam. The worbla will stretch a little, but be extra careful not to let it stretch too much, because it could easily rip in the process. Press the worbla down on the foam to seal it and work slow to make sure the curve doesn’t end up with creases all over it. try to keep it nice and smooth, but if you end up with some seams and creases along the edge, it isn’t that big of a deal. As long as the center is smooth you’ll be ok.
5: Once its cooled off a little bit, flip it over and heat up the back side and press the worbla down to seal it. Also go over the seems between the two piece at this point to make sure its sealed all the way around. 6: Next, cut off the excess along the edges, but make sure you leave about a centimeter of space around it. 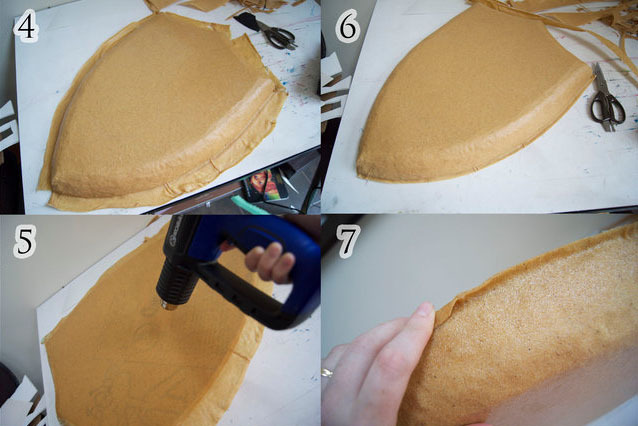 7: Use that centimeter of extra worbla you left along the edges to seal the seams even more. Heat the edge up, and press the excess up onto the side. Make sure you press it up on the side rather than down on the back. You want to keep the back nice and smooth. 8: Now, you’ll go back to your pattern and cut all the details out of it. If you want to you can leave one side uncut, like I have in my picture, But I think its easier in the long run to just cut all the pieces out. 9: Next, tape the center of the shield pattern onto the shield, like it shows in the picture. 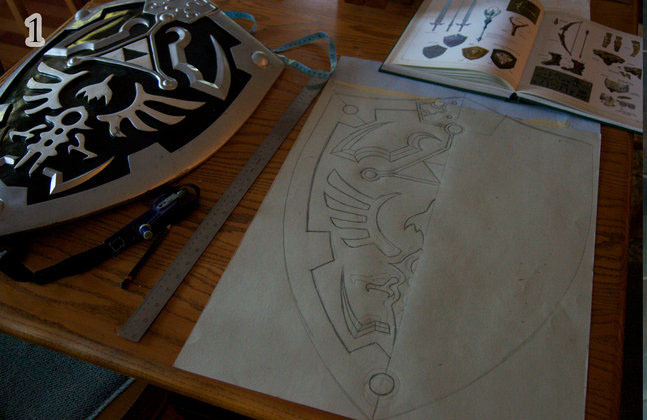 10: Use the pattern as a stencil to draw out all the details onto the worbla. Make sure you get the outside edge as well, and not just the center details. If you only cut half of your pattern details out, like I did, you’ll have to flip your pattern over to get the details on both sides, but if you cut everything out you won’t have to do this, which is why I recommend just cutting everything out in the beginning. 11: Some details might actually be easier to free hand. I did this with the swirly details on the top and with the bolts around the triforce and the corners. 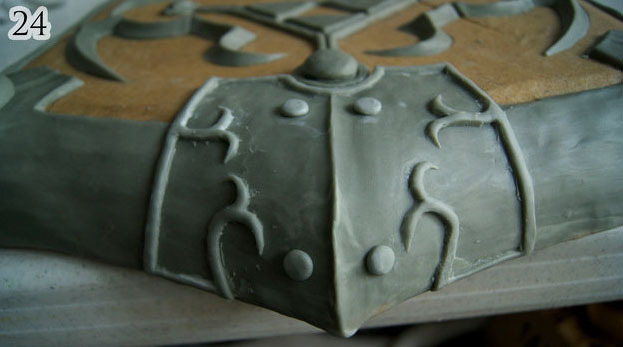 12: Once you have all your details drawn on your shield, its time to add the apoxie sculpt. Move your shield to a workplace that can get messy. 13: Apoxie sculpt is a two part epoxy clay. All you have to do is mix equal parts of A and B to use it. I was able to do my Hylian Shield and my Master Sword with a 4 pound kit. It is a little expensive, but the quality is worth it in my opinion. The clay doesn’t shrink or crack at all and is very strong and solid when completely hardened, so you’ll have a hard time damaging it. It is also very easy to work with and can be smoothed out nicely with a little bit of water. 14: To mix, just grab equal parts of A and B. 17: And knead them together until you can no longer see any streaks. If you don’t mix it well enough, it won’t harden properly. 18: The first thing you’ll add with the apoxie sculpt is the outside edge. Follow your lines around the outside edge and cover it with a thin layer of apoxie sculpt. Get it as close the the same thickness all the way around as you can. Use your clay tools to get a nice sharp edge, and smooth it out with some water. Add the sharp edges around the corners here too. 22: and shape it into place with your tools! make sure to dip your tools in water to keep it from sticking. 23: Do this with all the details on the center. 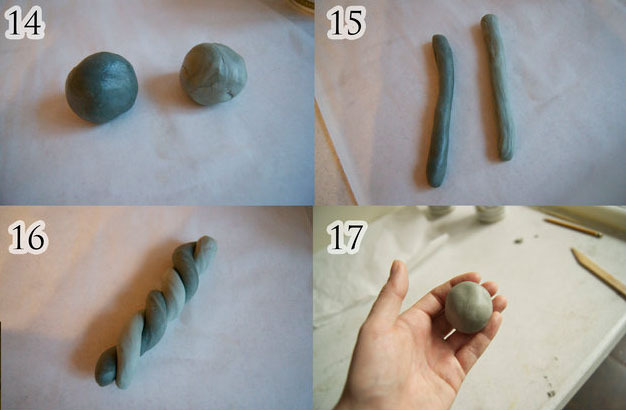 Some places might be easier to just use your hands rather than the clay tools. Also use your fingers to smooth the surface out with some water. Make sure that if you have slashes in your shield, to also put the slashes through the apoxie sculpt before it hardens. 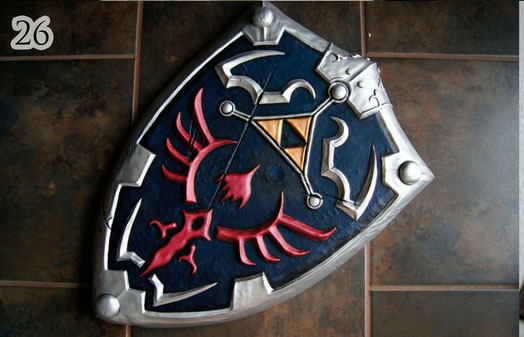 25: Here is what your shield should look like after all these steps. Let it harden for at least 24 hours before proceeding. 26: After 24 hours, prime it and add your paint! How you paint it is up to you, but I mixed metallic pigments into my paint to give it an extra shine. For details on how I paint my props and armor, check out my painting tutorial here! If you want details on how to use metallic pigments, click here! 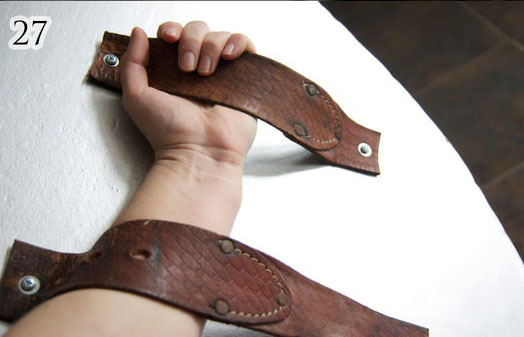 27: At the very last step I added a couple of leather straps (from an old leather belt) to the back for holding. This isn’t exactly what the back of the shield looks like in the game, but it works quite well. I marked where I wanted the straps to go on the back, drilled a hole through the worbla where I wanted the screws to go, then I pounded some dry wall anchors into the holes for extra support. I then poked some holes through the leather straps where the screws would go through with a nail and hammer, and then screwed the straps into the dry wall anchors. You can find dry wall anchors at any hardware store. If you want to make sure your leather doesn’t rip away from the screws, use washers with the screws.